How long you have wanted to have the branding in your CRM applications for your clients? 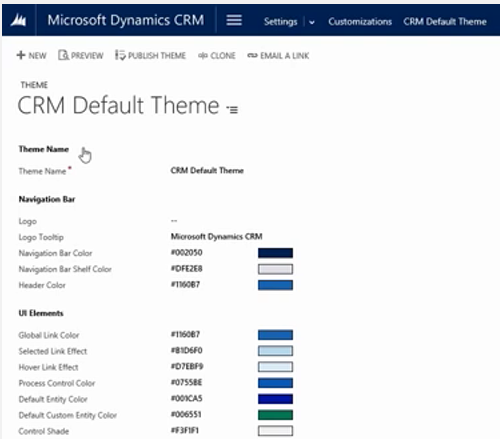 With CRM 2015 you will now be able to use branding and change the colours for navigation. You can also give the colour to your entity which is quite cool. There will be a new option in solutions area called Themes. This allows you to select the existing sample CRM Default Theme which user should be able to copy and create a new one. You can preview the theme to make sure you are happy with the final outcome and if you are, you can then publish the theme just like any other solution. All themes are not solution aware. However users can export and import themes to different organisations just like solutions. Hope to see many colourful CRM implementations now.